If you’ve done your prep right – finding a niche, creating a killer agency website, and building your social media profile – and managed to turn that first handshake into a sale, your next challenge is to generate more leads. While your website can be a powerful lead-generating tool, there are two approaches that will allow you to further maximize it for lead generation: inbound and outbound marketing. In the previous Build Your Agency webinar, the highlight of the discussion was driving leads passively (inbound marketing) and actively (outbound marketing). SEO, content marketing, PPC, and social media are your passive lead generation tactics, while searching for cold leads, qualifying them, and finding a common ground are the steps you need to follow for active lead generation. Which one should you choose to generate leads? Both. The question you should be asking isn’t about whether to choose inbound or outbound marketing, but how you can develop a lead generation strategy that incorporates both. You’re more likely to succeed if you’re not limiting your marketing efforts to one side of the sphere—it’s all about having the right mix. People search for information, and content satisfies this need. But, if your content is just sitting there and not getting the attention it deserves, you’re not just losing potential leads but also the opportunity to put your brand out there and showcase your expertise. There are many ways to distribute content that will help you generate business leads, but email marketing is one of the most effective strategies for this. 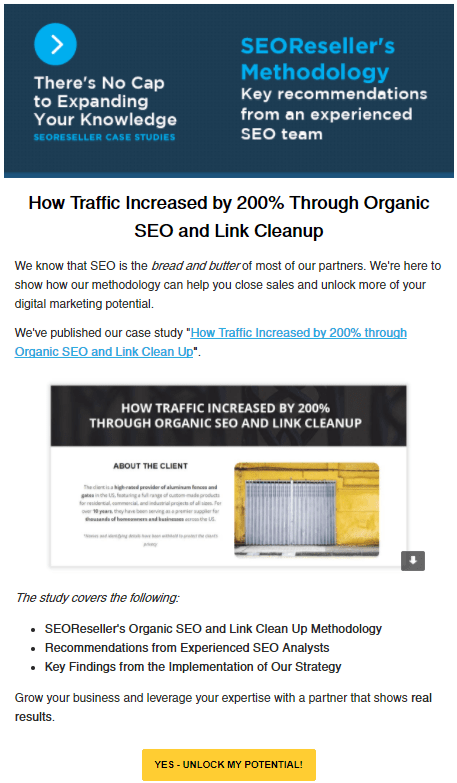 According to a study by Fractl and Moz, 53.2% of businesses attract leads by sending content about a topic that interests their target audience. The catch here is you need to send them content that is useful to their business – a great example is your monthly Hero content. The purpose of your email should be to offer free information without being too sales-y. The important thing is to get the attention of your leads and keep them engaged until they go from cold to warm. Like what we said in the How to Drive Leads to Your Agency webinar, you need to set up your cold emails with the right time intervals, so you don’t bombard your leads with too many messages. Lead magnets are your lure. But, here’s the thing: your lure needs to be something impressive and something that your prospects will find worthy of their attention. Otherwise, you’re not going to get them to even click on your lead magnet. How a lead magnet functions is simple – offering value in exchange for your prospect’s information. Downloadable white papers and ebooks are great lead magnets because you’re providing clients with information while getting their contact information. It’s as simple as having a form on your website that enables them to download the document when they provide their information. But, when using lead magnets, you need to provide these as obligation-free. How do you use lead magnets for your outbound marketing efforts? By building your contact list that you can use for warm calls. Warm calling is a bit tricky because you have to weave the conversation in a way that leverages the value that you’re offering. Get past the gatekeeper: There will always be a gatekeeper, or someone you have to pass through before you get to the decision-maker. You can do this by asking upfront for the name of the decision-maker, or re-affirming if you are speaking to the right person. Be brief: Nobody likes talking on the phone for a long time, especially clients who are busy running a business. Get affirmation that your prospect has the time to take the call. Establish context: Remember common ground? Use that in providing context when you’re on the phone with your lead. This makes it easier to kick-off a conversation and explain why you’re calling instead of being another intrusive salesperson. I saw that you created an account with us, and I’d like to take this as an opportunity to learn more about your business. Are you free to talk for a couple of minutes? When doing a warm call, don’t be too upfront; you’re not forcing them to buy anything from you – yet. You look for a trade show in your niche, sign up, and go to the event – this is often the cycle that agencies follow when they’re looking for a lead. But, how do you know if leads are going to find your agency amid the crowd? That’s when you use social media. If you’ve done your homework like what we told you in Step 0, you should have eyeballs on your social media profiles by now. And if you’ve joined groups and found mutual prospects attending the same trade show, this is an opportunity to connect with them and get that handshake. Let them know you’re attending: Respond to the event’s RSVP invite. Make sure you also post on your profile your booth number or where you’ll be staying during the trade show. Use the event hashtag: You can use event hashtags in two ways – to find prospects at the event and to let them know you’re at the event. Connect with your leads: The great thing about attending trade shows is you can establish common ground with your prospects. So after the event, send them a message about your meeting, share a write-up about the event, or simply extend a greeting that you look forward talking to them more in the future. Your passive and active lead generation efforts should not be disconnected. By combining inbound and outbound marketing, you have a more holistic strategy that will allow you to drive more leads – not just any leads, but leads that will fuel your agency’s growth. Ready to take your lead generation efforts to the next level? Check out the Agency Advantage program and see how we make it easier for you to find your next best clients.